ALTOONA- Two Altoona Family Physicians faculty – Debra Pike, MD, and Art Morrow, DO – and three third-year residents – Brittany Barker, DO, Timothy Romanoski, MD, and Jenna Stokes, DO – recently spent 14 days in Guayaramerin, Bolivia, on a medical missionary trip with Love in Action International Ministries (LIAIM). AFP started planning the trip a year ago, as an outgrowth of the experience Pike had on three prior trips with LIAIM. On this fourth trip, Pike assisted at a C-section delivery, where she instructed the surgeon on a Pfannenstiel incision, also known as a “bikini line” incision – more aesthetic than the typical vertical incision. 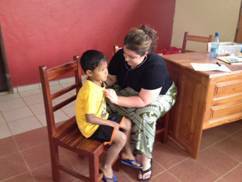 The family medicine physicians performed physical checkups on the 40 children in the orphanage, its staff of about 20 adults and their families and made two home visits. The most common challenges involved managing uncommon disease processes: parasites, amoebas, dengue (caused by mosquito bite) and finding out what natural remedies the patient had been taking, said Stokes. Instead of pills, the doctors of osteopathic medicine had their hands to help provide relief from musculoskeletal pain and had many opportunities to practice that area of their specialty. Stokes said one of her most rewarding experiences was providing relief from head and neck pain to a 10-year-old girl who had been injured at age 4 in a motorcycle accident. For Morrow, two home visits provided proof their trips make a difference. One 22-year-old man, paralyzed from the waist down, had been seen by Pike two years ago. “There’s been a remarkable, positive change in him thanks to the care he’s received through Love in Action,” Pike said. The team left medicine and instructions for wound care. Upon arrival he found a semi-conscious, elderly man in extreme pain from diverticulitis. A dose of antibiotics was given and by morning the man was pain-free and reoriented to his surroundings. “He had totally turned around and recovered,” Morrow said. LIAIM was founded in 1999 and opened its first orphanage, “Andrea’s Home of Hope and Joy,” in 2008 in memory of Andrea Zimmerman Mischel, the 30-year-old daughter of LIAIM founders Gary and Jerri Zimmerman. During their daughter’s illness with cancer, the people they had ministered to throughout their missionary career joined with them in prayer. During this time, the Zimmerman’s solidified thoughts of specializing in a ministry focusing on children. Upon news of their daughter’s death, the church in Guayaramerin donated land for an orphanage for LIAIM’s use. For more information on LIAIM, visit www.LIAIM.com.